Declaration of interest: All authors must disclose any financial and personal relationships with other people or organizations that could inappropriately influence (bias) their work. Please note that to verify originality, your article may be checked by the originality detection service Crossref and plagiarism - similarity checks. The system automatically converts your files to a single PDF file, which is used in the peer-review process. References: There are no strict requirements on reference formatting at submission. References can be in any style or format if the style is consistent. Where applicable, author(s) name(s), journal title/book title, chapter title/article title, year of publication, volume number/book chapter and the article number or pagination must be present. Use of DOI is highly encouraged. Formatting requirements: There are no strict formatting requirements but all manuscripts must contain the essential elements needed to convey your manuscript, for example Abstract, Keywords, Introduction, Materials and Methods, Results, Conclusions, Artwork and Tables with Captions. Peer review: This journal operates a single blind review process. All contributions will be initially assessed by the editor for suitability for the journal. Papers deemed suitable are then typically sent to a minimum of one independent expert reviewer to assess the scientific quality of the paper. The Editor is responsible for the final decision regarding acceptance or rejection of articles. If there is more than one appendix, they should be identified as A, B. Define abbreviations that are used in the article. mention there, as well as in the footnote. Ensure consistency of abbreviations throughout the article. Math formulae: Please submit math equations as editable text and not as images. • Number the illustrations according to their sequence in the text. Explain all symbols and abbreviations used. Please submit tables as editable text and not as images. Tables can be placed either next to the relevant text in the article, or on separate page(s) at the end. Please ensure that every reference cited in the text is also present in the reference list (and vice versa). Any references cited in the abstract must be given in full. Unpublished results and personal communications are not recommended in the reference list, but may be mentioned in the text. 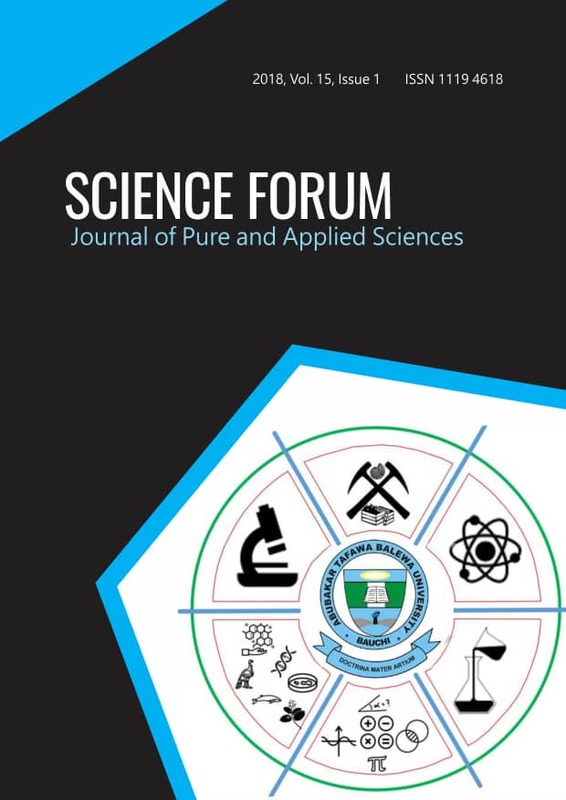 Authors will be asked to make a payment of N25, 000 publication fees to the journal as soon as their article has been accepted. The journal makes articles available online as soon as possible after acceptance and payment. A Digital Object Identifier (DOI) is allocated, thereby making it fully citable and searchable by title, author name(s) and the full text. Articles are finally printed and published in volumes. The views expressed or ideas reported in articles published in this Journal are those of the authors. Authors are therefore strictly responsible for any violation of copyrights.